This beautiful girl! That wash of greens in the bamboo! The magical soft light! Eeek! The first time I photographed Ally, towards the end of her winter headshot session (in studio) we were blessed with my favorite kinds of wonderful, fat-flakes snow showers… Made us all so happy we had to run outside and grab a few photos in that winter wonderland (before the snow got crazy that night, if I recall correctly!) Those snowflake photos have remained some of my favorite portraits for the are the very embodiment of joy: an enthusiastic client and great timing! Cut to summertime, and enter timing with new summer-related challenges: Ally’s first high school senior pictures were postponed when a tropical depression moved through Denver (it was an unusually wet summer here… which was AWESOME, but did make logistics challenging for outdoor photo sessions). Her second session date was ALMOST postponed when it so happened that at her chosen location of the Denver Botanic Gardens, the Rocky Mountain region’s first ever stinky Corpse Flower was blooming for 48 hours and attracting a record number of 30,000 people ON the day of her session! We considered changing locations… but instead decided to stick with our plan and make it work. We started by grabbing a few urban photos in Cherry Creek North on our way up to the Gardens. I’m always amazed how really, location photos can be produced almost anywhere, as long as you have good light. And, hello?!? She just rocked this session. Perfect wardrobe, lovely makeup by Ashleigh Franke (which amazingly didn't melt in the heat of the day!) 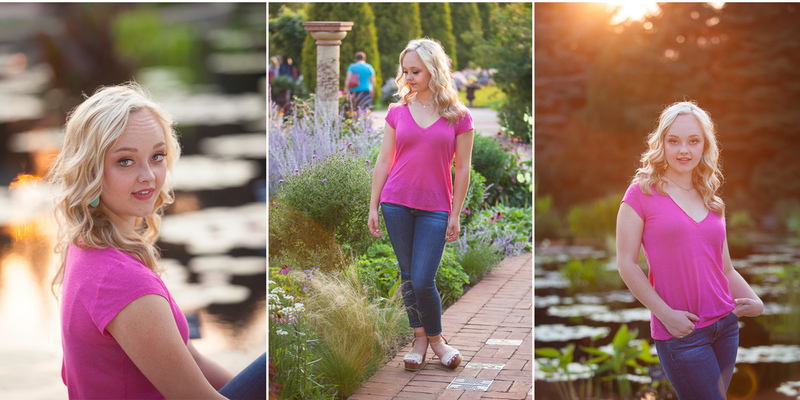 We paired her more formal outfits with the city-scape... and then brought her more feminine choices to the gardens. After our mini urban session, we were off to greet the throngs of people at the Gardens. Thankfully, and we found plenty of gorgeous opportunity for intimate portraits despite the crowds -- I have the perfect camera lens to be able to isolate my subject and make everything else go away. But really, it seemed like most of the people were up near the actual "stinky" flower and to be honest, I'm pretty sure we all forgot anyone else was there! Ally shone beautifully in these floral and dreamily green summer landscapes. I’ve been wanting to photograph portraits in the bamboo walk for ages (that opening photo!) ... doesn’t she look like she’s in a fairy tale in this wash of colors and greens? And her lacy white dress and flower pink t-shirt were both just perfect choices in this setting. So thrilled to have had the chance to work with you again, Ally!! Wishing you all the best in your next chapter! !